DBF to XLS (Excel) allows you to convert your dbf files to XLS format. XLS is a wide-used format, many programs allow saving information in XLS format. It is very convenient and MS Excel provides many possibilities for information management. But MS Excel does not understand some types of dbf files, it does not understand memo fields, it does not understand long character fields. Please contact us with the contact form to report difficulties, strange behaviors or persistent problems, and quote the program name or the number 16730 . The DBF to XLS (Excel) program allows you to convert your dbf files to XLS (Microsoft Excel) format. This is the download page for DBF to XLS (Excel) - The DBF to XLS (Excel) program allows you to convert your dbf files to XLS (Microsoft Excel) format. 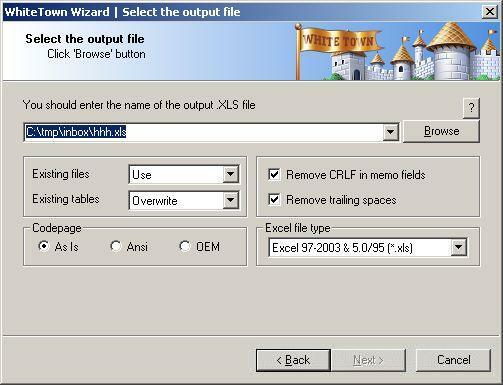 XLS is a wide-used format, many programs allow saving information in XLS format. It is very convenient and Microsoft Excel provides many possibilities for information management. But MS Excel does not understand some types of dbf files, it does not understand memo fields, it does not understand long character fields. The DBF to XLS (Excel) program decides these problems. It allows you to transfer your dbf files to XLS quickly and easily. The program supports dBase III, dBase IV, FoxPro, VFP and dBase Level 7 formats. You can run the program in a batch mode using command line interface. Besides, it includes a DLL which you can use from your own application.